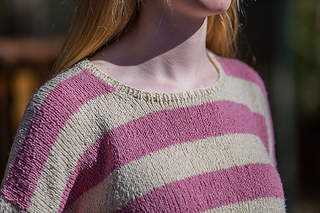 Finished Bust: 45.5 (48, 50.5, 53, 56, 60)"
This simple striped pullover is the perfect easy sweater. 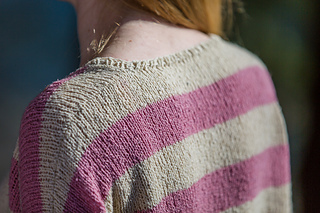 Loose in the body with fitted sleeves, this sweater is casual and comfortable. Dream up your own fun color combos for a personalized look. Finished Bust: 45.5 (48, 50.5, 53, 56, 60)” Shown in 45.5”, to fit 32-34” bust circumference. US 5 circular needle, 32” long—for body. US 4 circular needle, 24” long—for neck finishing. US 4 dpns—for sleeves.